The 3D platformer will be out sometime this year. A Hat in Time is still on track for release this year, although exactly when this year remains a mystery. I suspect it'll be the 3D platformer to watch after Snake Pass and Yooka-Laylee have done their things, a feeling supported by the latest Kickstarter update, which reveals the setting of the game's fourth chapter. 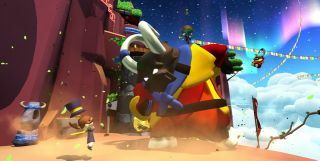 In addition to boasting about the chapter featuring "the biggest goats known to man", the developer helpfully explains that Alpine Skyline "is the highest area of the A Hat in Time planet. It's a range of sky-high mountains, linked together with flags, perfect for zipping along to get around quickly! You can connect more mountains as you progress, giving you access to new mountains and new challenges". There's also an explanation for why that desert environment was ditched. "When we initially set out to develop A Hat in Time, we wanted this chapter to be a desert, but we soon found that there was a mismatch between the gameplay we settled on, and the visuals. Before we went too deep into the visuals, we decided to change direction, and go for something that would fit our gameplay better. That's how Alpine Skyline was born!" A Hat in Time will be out sometime this year, for Windows and Mac.